Preparing Lentil-Cashew-Stuffed Peppers from The Detox Prescription, Day 5! This recipe puts the C in cashew--with 576 percent of your daily vitamin C requirement met, you're sure to ward off colds and infection. And we'll also give this recipe an A for its 198 percent vitamin A content: Carotenoids, lutein, zeaxanthin, lycopene, and beta-carotene act as antioxidants and have anticancer activity. Kale, onion, and curry boost the detox power, and the super antioxidants ellagic acid and resveratrol (found in the raisins) quell free-radical activity--all in a mouthwatering, proteinaceous , peppery delight! In a small bowl, whisk the curry powder into the cashew (or other) milk. Set aside. In a 7" skillet, heat the oil over medium heat. Add the onion and coof for about 3 minutes, or until soft and translucent. 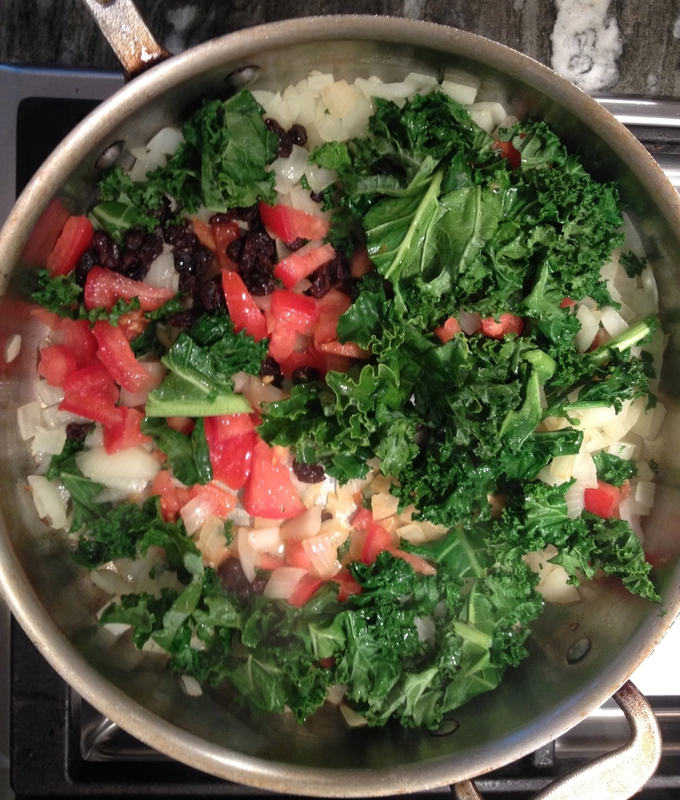 Add the kale, tomato, and raisins and sauté for 4 to 5 minutes, or until the kale leaves begin to wilt. Reduce the heat to low and add the chopped cashews and cashew milk mixture to the skillet. Stir until the kale and raisins are evenly coated and allow to cook for about 5 minutes. Remove from the heat, combine with the cooked lentils, and season with sea salt to taste. Stuff the pepper halves with the lentil-cashew mixture, arrange in a 13"x9" oiled baking pan, and bake for about 45 minutes, or until the peppers are tender and the lentil mixture is heated through. Tip: Since bell peppers are number seven on the Environmental Working Group's Dirty Dozen list of the most polluted produce, it's important to go with organic whenever you can. Frontier Natural Products and Simply Organic sell organic, non-irradiated curry powder. *The Detox Prescription contains a recipe for Raw Cashew Milk.